Blazing Wisdom Institute - Are gestures of respect more than cultural? Are gestures of respect more than cultural? Being respectful is actually an essential practice, a precursor to the development of clear faith, and not just a praiseworthy quality or hollow ritual. To make the right choices about where (and in whom) to place our faith and confidence, we must first figure out the reasons why we should cultivate (and not just show) respect for others. The usual reasons don't apply. We can put aside slavish displays of respect before alpha males, beauty queens or celebrities, and cease presuming that wealth, power or intelligence alone warrant respect. Those conventional forms of "respect" have no value for our spiritual development. In fact, we should adopt, as our starting point, the view that respect that is expected, or demanded, is of no interest or significance at all. I have worked, at times, with people who demanded respect on a daily basis, because they feared (correctly) that they had not truly earned it. I am similarly wary of those with high titles who grow indignant when offered an insufficient show of respect (not because they want to teach others the value of respect, but because their feelings are insulted). Now, everyone is fundamentally deserving of respect -- just not necessarily for the reasons they imagine. As a general practice of goodwill and harmony, then, we offer respect despite the fact that it may be demanded for all the wrong reasons. This general practice of respect is a natural outgrowth of understanding interdependence and appreciating the common spiritual heritage and condition of all beings with whom we share this world. One might relate such respectfulness to the practices of immeasurable kindness and equanimity according to the Mahayana tradition. In the context of our spiritual practice, however, respectful faith is a different order of respect from that we simply owe all our fellow beings. It has a number of purposes and benefits. Consider the following three perspectives on respectful faith. First, respectful faith means that we recognize that there are serious limitations on our ability to figure out the universe through sheer force of will or personal brain power. We need to rely on qualified individuals whose experience in such investigations and pursuits exceeds our own. For many of us, this can actually be quite humbling, and scary. We may often have been burned by others in whose authority we placed our trust, but whose wisdom and guidance turned out to be highly suspect, if not sham. So we may feel it is particularly hard to bow our heads or fold our hands out of genuine respect for another practitioner. This is the first valid ground for having respect -- acknowledging, as hard as it is to admit, that we have to seek help to overcome our ignorance. We see that our own self-importance and powerful sense of self-determination may actually be hindering us. These favorite strategies for protecting and promoting ourselves, in reality, are just holding us back. Having respect drills this point home and softens and opens us to receive valuable input and support from others. We employ respect as a tool to sensitize ourselves to the manifestations of wisdom outside of our own mental and emotional constructs. Second, respect breeds a profound form of humility that opens the way to realization. As we practice, our respect grows for the teachings that enable us to train our minds and abandon our desperate ploys that achieve, at best, only a false sense of security, and ultimately betray us. Our respect and veneration grows equally for those who have learned to relax into life without such treacherous reliance on intense neurotic patterns and fixations. Through such respect and veneration, any ideas we might have of being anyone special drop away. At this level, when others fold their hands or bow to us, we can't think of any reason to care, other than to be glad that others are learning to benefit from a respectful attitude. Ironically, then, once we really know how to respect our spirtual friends and guides, we can accept respect as well without being foolish. At this point in our practice, we are really opening up, and not mistaking nonsense for anything of spiritual value. We get closer to, and more confortable with, our true nature of empty clarity. Third, respect completes or closes the circle. We often hear teachers remark how respect for realized beings and the path they lay before us only deepens as we, ourselves, progress. We may also (if we are paying attention) notice that these same teachers demonstrate far deeper respect for their teachers and for the teachings they receive and impart than we are capable of. This, in itself, is an important teaching about the value of respectful faith. As our minds and hearts become clearer, lighter and less confused, we eventually realize that it makes a lot of sense to have respectful faith in those who have even greater respect for the profound teachings of dharma than we do, who are more attuned to the key points of the teachings; and that having such faith is one of the key catalysts for our emulating their superior examples and achieving comparable states of experience and realization. Interestingly, it is the qualities of respectful and lucid faith in others in which we are inspired to have faith! The benefits great beings derive from the qualities of faith impress us very deeply. Being so impressed in turn benefits us profoundly. And so the spark is passed on. Of course, the tradition being so rich, whole treatises could be (and have been) written on the value of respectful faith. 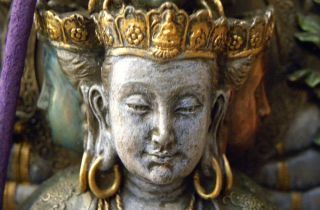 There are many special and important aspects of respectful faith within the Vajrayana tradition that we have not even mentioned. Here I have simply offered a few reflections on the subject that I personally have found helpful.